Feliway Spray is a synthetic copy of the feline facial pheromone, used by cats to mark their territory as safe and secure. By mimicking the cat�s natural facial pheromones, Feliway creates a state of familiarity and security in the cat's local environment. As a result, Feliway can be used to help comfort and reassure cats while they cope with a challenging situation and help prevent or reduce the stress caused by a change in their environment. 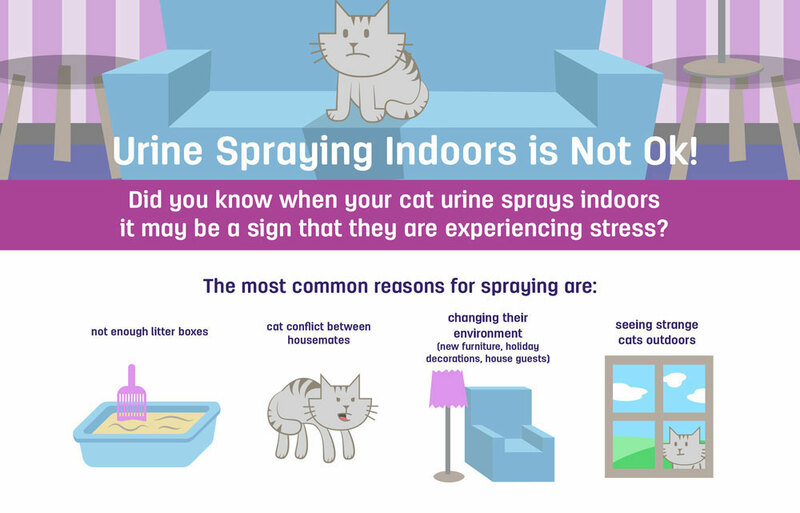 Keep your cat feeling right at home with the Feliway Spray. When a cat feels comfortable in their environment, they rub their cheeks against objects like the wall or furniture, leaving a facial pheromone behind. 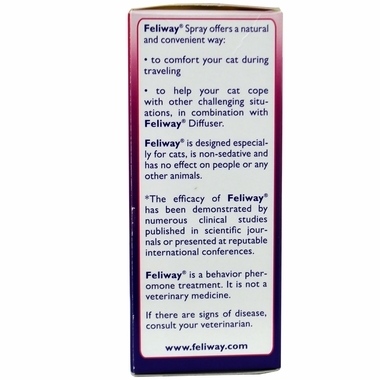 The effect of Feliway�Spray lasts 4 to 5 hours. Each 20 mL bottle delivers about 125 sprays. 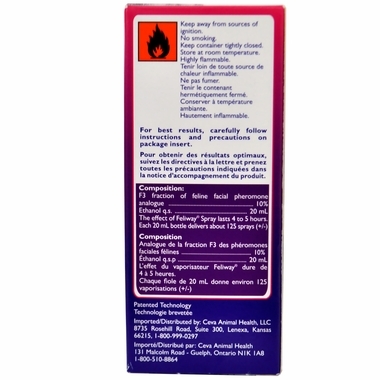 DO NOT SPRAY directly onto your kitten/cat. Please allow 15 minutes before introducing your kitten/cat to the object or area sprayed to allow the alcohol carrier to evaporate. What is Feliway? Feliway is the UK�s leading cat behaviour product scientifically proven to help stop and prevent unwanted behaviours in cats. How do I know if my cat is stressed? When cats become stressed they can start behaving strangely or acting inappropriately. Examples are urine marking, vertical scratching or intercat tension. However cats won�t always exhibit these extreme behaviours to show they are upset, they may appear to be withdrawn, nervous and easily startled or demanding attention. They may also groom themselves excessively or get into conflict with people, cats and other pets in the household. Upset cats may avoid social interaction, hide or can even go off their food. 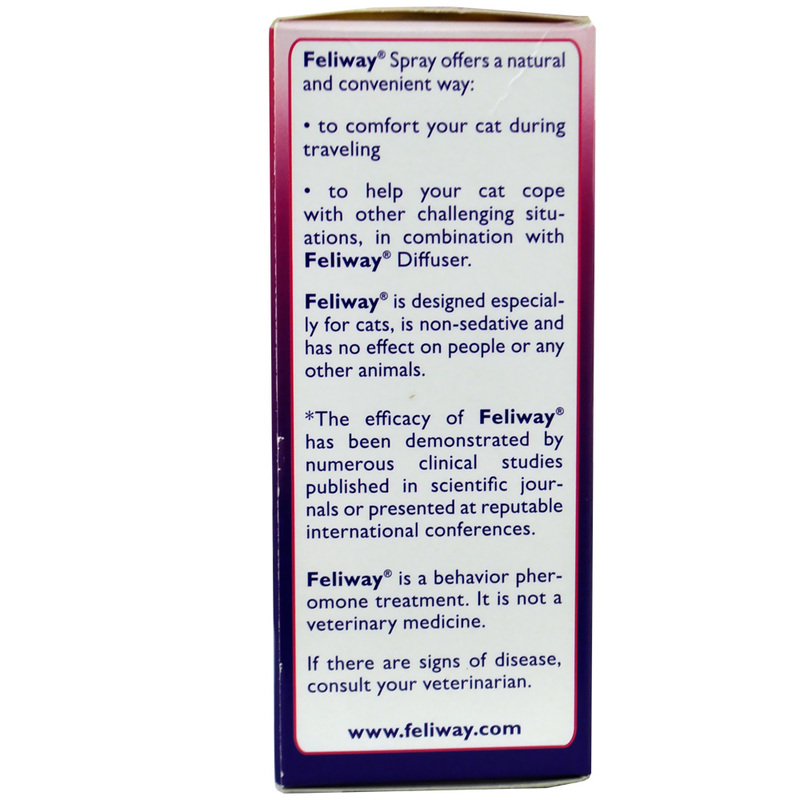 We have been using the Feliway (219 mL size) calming spray for a year now, with results that can best be called mixed. We have a family of kittens that we adopted from a feral mom kitten (long story.). They are nervous to say the least, the spray and the diffuser used together for us have worked, but not completely. The cats can go back to marking and urinating in the house (they are indoor only) at unpredictable moments for unpredictable reasons. Long story short, if we didn't use the Feliway products (spray and diffuser) it would be worse and the house would be in worse shape than it was headed before using them. You have to be consistent in it's application. We have tried other brands, with less predictable results and lasting effects. ProsEasy to use. Seemingly harmless to the cats and harmless to home surfaces. ConsExpensive. MUST be consistent in application. Sometimes hard to find unless you get them from HealthyPets.com. I love the spray! When we have a pet sitter, it helps keep the cats calm and it is easier for the cats to accept the sitter and relax. The Fellway Spray has been great! 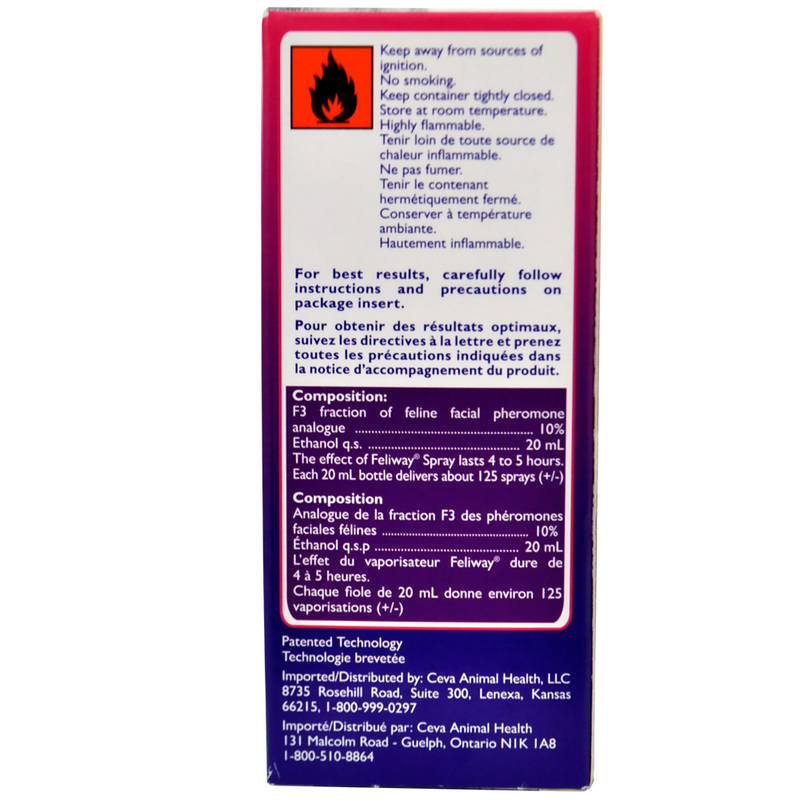 I purchased it for my dog who has a panic attach every time we have a thunder storm (in Florida we have a lot), I spray a couple of sprays on a bandanna and place it around his neck. It calms him quite a bit. Although if the storms are really bad I still have to give him medication from the vet. The spray has been well worth the money spent to see some relief for my dog. It really works! Because of this product, I can keep my Greyhim buddy.